This type of mixer is made up of S.S. or M.S. material. The sides of the blender are also made up of S.S. or M.S. material. It consists of a centre shaft of appropriate diameter and are either made of S.S. or M.S.material. The centre shaft is fitted with specially designed agitator blades in order to provide contraflow action. All the material in the mixer is constantly circulated from one end to the other. In larger mixer it is provided with inner and outer ribbons Sweeps maybe added to the outer ribbon to provide through clean out. The outer ribbons move ingredients towards the discharge while the inner ribbons constantly circulated material in opposite direction. The either ends of the vessel are provided with stuffing boxes on the shaft diameter. This stuffing box prevents leakage of material and also prevents material from entering into the bearings. The shaft is supported on heavy duty pedestals. 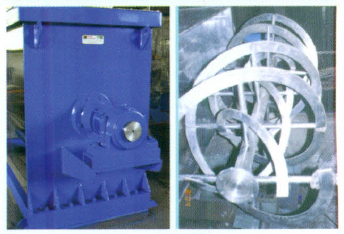 The mixer is provided with a hopper and discharge. The drive consists of a suitable gear box coupled to the motor. 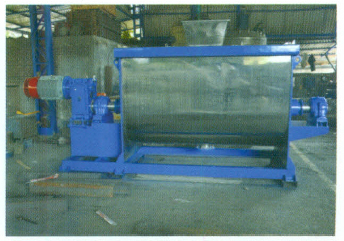 Ribbon Blenders consist of a U-shaped horizontal trough and a custom fabricated ribbon agitator. The ribbon agitator consists of a set of inner and outer helical agitators. The outer ribbon moves materials in one direction and the inner ribbon moves the materials in the opposite direction. The rotation of the ribbons results in the movement of the ingredients both radially and laterally to insure thorough blends in short cycle times. Sweeps may be added to the outer ribbon to provide through clean out. Ribbon blenders can be designed as a fully integrated plant with raw material delivery, sieving, filling, packing modules. Each module can be customised to suit the process requirements and can also be fully automated. * Recommended for dry mix powders, grouts, power, Putties, Flour, corn meal. Designer for use in food, pharma, chemical, painr, construction chemicals and various other indutries requiribg a quick and efficient blending operation.